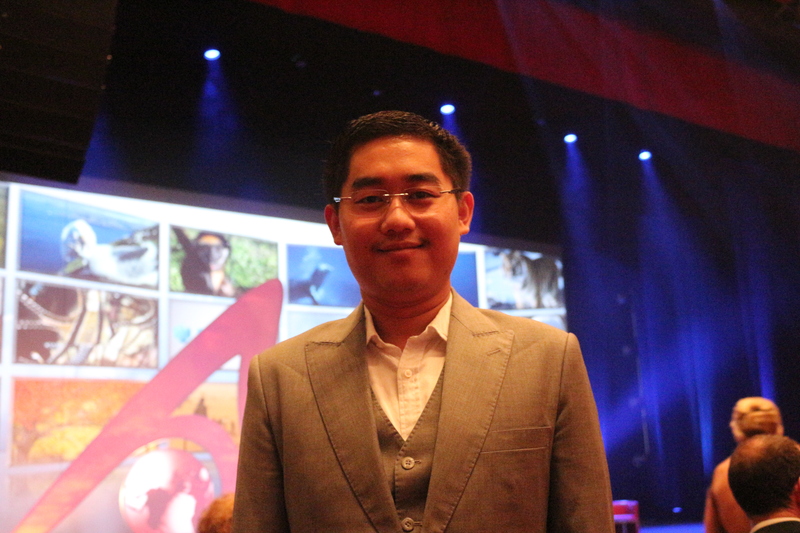 Pheakkdey Nguon, participant in IIASA’s 2012 Young Scientists Summer Program, and IIASA Annual Fund recipient, has won an IPCC reserach fellowship to fund his research on REDD+ in Cambodia. In this interview he discusses his research plans, the award, and his experience at IIASA. Pheakkdey Nguon at the awards ceremony for the IPCC research fellowship on 30 September, 2013. Nexus: Please tell us about the research that you will be working on under this grant: What is the major question that you’re studying? Pheakkdey Nguon: The main objective of my dissertation research is to better understand how governance systems organize and distribute knowledge on the UN’s REDD+ Program (Reducing Emissions from Deforestation and Degradation) across different groups of stakeholders with conflicting interests, and the resulting impacts of such systems on forests and people in Cambodia. I am basically asking to what extent the different groups of stakeholders in Cambodia have considered REDD+ as salient, credible and/or legitimate for addressing deforestation, forest degradation and sustainable livelihood development. How will you address this question? Theoretically, I am drawing from sustainability science and political economy of institutions and decisions literature to reveal ways in which perceptions, institutional locations, and contextual differences affect patterns of stakeholders’ engagement in REDD+, a complex environmental governance project that spans multiple levels of implementation and involve various groups of stakeholders. Methodologically, I am using qualitative methods such as key informant interviews (up to 150 interviews), observations of REDD+ policy processes (up to 70 observations), and extended archival research (e.g. government reports, newspapers, policy briefs, feasibility studies) to answer my question. The interviews offer a first-hand account of the criteria that different group of stakeholders use and their justifications for using those criteria to assess REDD+ projects within their project areas and in Cambodia. Observations of REDD+ policy processes (e.g. meetings, workshops, consultations) provide information on the participation and engagement of different groups of stakeholders in the production, examination and dissemination of knowledge on REDD+ within the three project sites and in Cambodia. Finally, archival research is conducted for two main reasons: (1) to validate, compare, and contextualize information gathered through interviews and policy observations; and (2) to add to the study information that would not be appropriate or feasible to collect through interviews or observations, either because of the political sensitivities of the topics or time constraints. Academic and policy-oriented literature on REDD+ has been prolific within the last decade. Its central focus has been on addressing the technical issues – defined largely by the scientific and policy communities – that will improve the design and implementation of REDD+ so that its outcomes achieve the goals of effectiveness, efficiency and equity (the so-called “3Es” criteria). Whether these “3Es” criteria – or the underlying logic of REDD+ in general – are as relevant for the different groups of stakeholders in developing countries as they are for the international policy community has, however, been insufficiently substantiated in the literature. Therefore, my justification for exploring the abovementioned question departs from my assumption that the preferences and perceptions of stakeholders cannot be presumed to coincide with aspirations of scientists and/ or policy-makers who have been working on REDD+. Understanding how stakeholders interpret, experience and assess REDD+ is central to understanding the appropriateness of REDD+ as an initiative aiming at addressing deforestation and forest degradation in developing countries. How does it relate to the work you did at IIASA? I classify myself as a sustainability science geographer, and so I came to IIASA already very inspired because people who have had tremendous intellectual influence on me have at certain points been affiliated with IIASA, for example Robert Kates and William Clark. The main activity that I was doing during my YSSP participation was trying to translate literature from these intellectuals into testable hypotheses that will help me understand the question(s) I am asking in my dissertation research. This was not an easy process. It involved a lot of conversations between me, my advisor at Clark (Dr. Anthony Bebbington) and my advisor at IIASA (Dr. Hannes Böttcher). I would also like to acknowledge the very engaging and informative conversations that I had with Dr. Anthony Patt, Dr. Joanne Linnerooth-Bayer, Dr. Michael Thompson, and fellow YSSPers on this matter. They were very generous with their time. How did the YSSP help you to get this grant? I came to the YSSP with the main intention of finalizing the questions that I will pursue for my dissertation research. My goal was to have a defensible dissertation research proposal by the time I return to my PhD program at Clark University. I was also hoping that I would be able to build on this proposal to apply for research grants to pursue my empirical fieldwork in Cambodia. During the YSSP, I was very fortunate to be able to work very closely with Dr. Hannes Böttcher, from the Ecosystem Services and Management Program. Similar to other PhD students, I had so many questions that were floating in my head, some of which did not make any sense now that I am reflecting on them. Therefore, I very much admired Dr. Böttcher for his patience, supports and willingness to engage with all the ideas that I was coming up with. Through these many conversations, I did finish my dissertation research proposal that I defended at Clark. And this is the very same proposal that helped me get the Intergovernmental Panel on Climate Change (IPCC) research award. Additionally, I was also able to get one of my dissertation papers accepted for publication at Environmental Science and Policy (DOI: 10.1016/j.envsci.2013.04.011) during my time at IIASA. I hope that my research will have some impact in the academy and in the realm of forest governance and climate change debates based in a developing country context. In academe, my research engages with politically broader discussions on the science-policy interface, market-based approaches to forest governance in developing countries, stakeholders’ assessments of policies on climate change, and national sovereignty issues. Beyond the academy, this research is relevant to the ongoing debate on how scientific knowledge is being received, perceived and reconfigured in environmental governance policy that spans multiple scales of implementation and involves various groups of stakeholders. Finally, significant for the national and international policy negotiations on REDD+, this study should contribute to the debate on why certain groups of stakeholders have been supportive, while others have been critical, of the implementation of REDD+ projects in developing countries.